This was the last of the IDW Teenage Mutant Ninja Turtles comics I managed to pick up. So I don’t know what happened between that issue and the two I’m about to review. So last I heard Splinter took over the Foot (but I don’t know what happened to the Shredder), Krang was about to go on trial for all of his many war crimes, and Raphael and Alophex were a cute couple. The last comic I was able to buy before my job loss was issue #37 so if I don’t know what’s happening in these comics you know why. My friend Sean seems to insist I get new comics even though I have so many of my old ones to go through. Knowing I enjoyed this comic he has offered to grab these issues for me in place of the Titan Robotech comics. I certainly appreciate it and with most of the other titles I was collecting or interested in either ended or in unwelcome hands it was really the only choice left. Apparently #81 starts a new story arc according to his checking so we should be starting off on a good point. For those of you who haven’t been following the series, here’s what I do know. 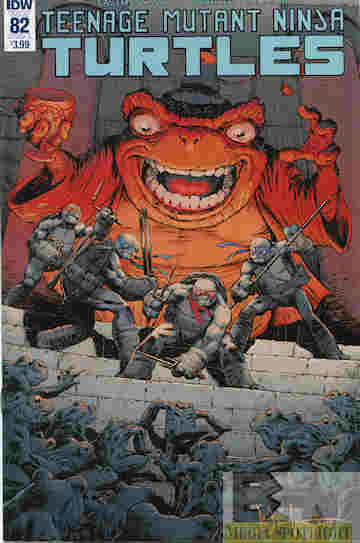 In this version Splinter and the Turtles are reincarnations of a family of ninjas who broke off from the Foot Clan after Oroku Saki corrupted them. Oroku and Hamato Yoshi competed often but it was Yoshi’s love of Tang Shen that drove the wedge. If memory serves Saki thought she was too positive an influence on Yoshi, who was fighting his own rage issues. Saki killed them all. Later Yoshi and his sons were reincarnated into a rat and four turtles respectively, all part of a series of intelligence-boosting by Baxter Stockman, a greedy scientist working for an alien named Krang who was out to conquer the universe and thus far pretty good at it. One of the lab assistants, April O’Neil, rescued them from a fire but they had been exposed to a mutagen that when she next saw them had mutated them into anthropomorphic ninjas. They made a friend in Casey Jones, had all sorts of adventures, and dealt with the modern incarnation of the Foot Clan, which included a resurrected Oroku Saki, now calling himself The Shredder and in conflict with Krang and his Utroms. There were also gangs, other aliens, more mutations, and a whole lot of action. Now I’m curious to see where our heroes are nowadays. Let’s find out. They don’t actually FIGHT crime. They just WATCH it. Nice to see the same writing team on board after 80+ issues. That rarely happens anymore, and they’re a good team. This is one of the few IDW titles I was enjoying. They also set up the story so far: “New York City is in ruins after the war between the Triceratons (the alien race of dino people that practically every incarnation of the franchise has dealt with) and the Earth Protection Force. Baxter Stockman is lauded as a hero. (If only they knew.) Casey and Hun (in this version son and father who don’t see eye to eye, Hun in charge of this version of the Purple Dragons) have made a truce and the Turtles’ relationship with Splinter is at a low point.” (I’m betting it has something to do with him taking over the Foot. We open with Splinter and Leonardo in their own separate bases, both meditating. (Like father, like son.) And both have the same vision, of the Rat King leading people over a damaged bridge with his flute. In this incarnation the Rat King is one of a series of…I’m not quite sure what they are. They’re some kind of paranormal beings, another being Kitsune, a witch who was with the Foot but for her own agenda. I don’t think I learned what beyond the paranormals engaging in some kind of war or competition or something. 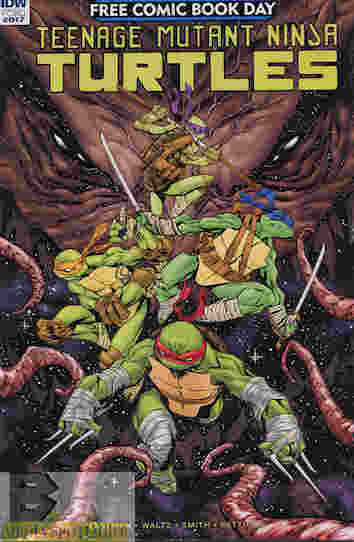 While Splinter is unclear what it means Leonardo is sure the Rat King is back with a new agenda. And we see later he appears to be doing just that with a group of kids. He’s kind of extremely evil. While Baxter continues to soak up being a hero he’s called away by Bishop just as the Turtles use the teleporter to visit the Toad Baron in his Den Of Delights. I don’t know who or what he is but he’s not happy to see them and orders his frog men to attack them, leading to the next issue. This might have been interesting but it so doesn’t happen. So the Toad Baron is Rat King’s brother. That why the Turtles went to see him only to get attacked by three of his attendants…in one of the most one-sided fights ever. You almost feel sorry for the three suckers. They are so ineffective it isn’t funny. Actually it is, especially for Donatello. After that, the Baron making Raph throw up for some reason (keep it classy, IDW), and Mike willing to eat pretty much anything, even this gross food they finally talk the Baron into helping them. He leads them to a set of doors leading to his other siblings. Apparently one of them was taken out during a Ghostbusters crossover…which means the Ghostbusters are canon to this series? Are they from another dimension or this version of New York? There’s also some talk about some Dragon father not being brought back. That’s info I’m not up on, but they eventually choose one of the brothers, the isolationist Manmoth, who looks like a mammoth. (Each of the siblings are based on an animal…from some kind of Zodiac I imagine, possibly Chinese.) And Manmoth doesn’t really like visitors. I’m not sure what he’s supposed to be able to do, but while they’re doing that Rat King is drawing up more children. Meanwhile stuff is going on in New York. Bishop secures the location of the Triceratons by threatening to send Baxter to jail and for some reason Bishop IS white, despite being black in the other two incarnations he’s appeared in (the early 2000s cartoon and the most recent Nickelodeon series). I don’t know why. Baxter is still black, which he has been since the beginning (except for the first cartoon for some reason where he was white). I’m not making this a race thing. I’m just asking for consistency. If they made April a blond I’d make the same comment. Meanwhile, Jennika (she was part of the fight alongside Casey and Hun last issue) reports on the fight. Splinter isn’t happy to see Casey and Hun making peace because apparently he doesn’t believe in redemption. Also Jennika appears to be attracted to Casey. I don’t know if he and April ever actually got together in this continuity (I know they were interested in each other) or if they still are together considering the Turtles’ current attitude towards Splinter (interestingly the only good parent/child relationship right now is the one where the father used to drunkenly beat up the son then took over a street gang to beat up other people–weird little continuity) they might not be. Final Thoughts: While I am missing a lot of information (I’m not sure if I should track down the back issues or the trades but it’s a moot point given my lack of income) The comic seems just as good as I remember. This is an example of how you take an older property, do something new, and still remain faithful to the spirit of the franchise, something that really doesn’t happen much anymore. If you’re looking for a good comic to read, or something to save you from Rise Of The Teenage Mutant Ninja Turtles but you need your Turtle fix, you really should be getting this series if you aren’t already. Sean has promised to get me another issue, which may be the conclusion of this arc so we’ll be doing this again soon. 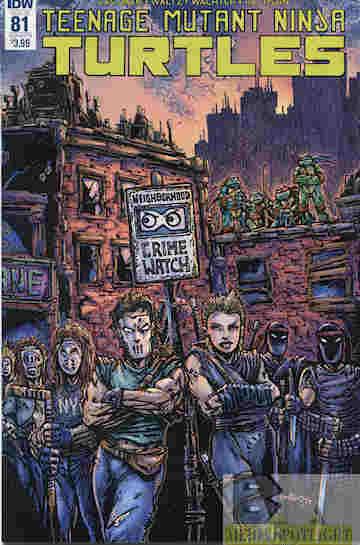 Posted by ShadowWing Tronix on June 13, 2018 in Today's Comic and tagged comic review, IDW Publishing, Teenage Mutant Ninja Turtles. I”m glad to hear that you enjoyed these recent TMNT comics, Tronix. If other writers and artists would do the same with “old school classic” properties as these writers and artists have done with TMNT, then you would have less people upset with things such as the recent proposed cartoon reincarnation of Thundercats. It’s all about respecting the creative property, and that’s what IDW’s artists and writers appear to be doing with TMNT.